Garden furniture is a great way to decorate your back yard. There are many types of garden furniture and you can create your own garden style. And if you like exterior or interior design you can start your own business and sell garden furniture, tools, and accessories. However, if you want to overcome your competitors you need a website. 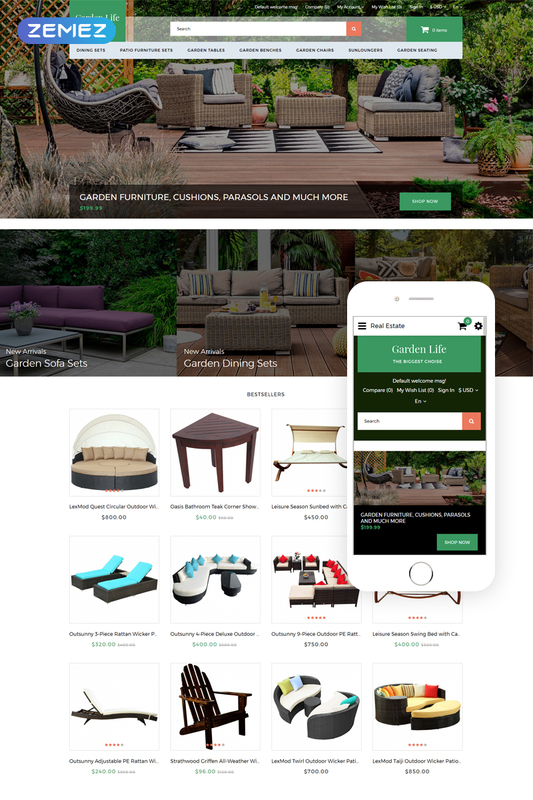 This is why we present you a Garden Life OpenCart theme. Developed for real estate businesses it has eye-catchy and easy to edit design with effects and visual elements. Moreover, Garden Life was built with OpenCart e-commerce plugins and includes cart, wishlist, and compare buttons. It also allows you to provide customers from other regions with comfortable shopping due to currency options and language options. It has advanced search and pre-built category pages for easy navigation. And if you want to keep in touch with clients you can use a newsletter or social options. It is highly responsive, easy to edit and maintain a website theme. Just check the demo to see all by yourself.